It’s not mass insanity, but rather mass infantilism, that necessitated the “unprecedented” security measures taken Thursday at the University of California, Berkeley so that mild-mannered conservative pundit Ben Shapiro might speak there safely. Worse, the whole campus seems to be having a spoiled-toddler meltdown not just about Shapiro but about the whole idea of free speech. 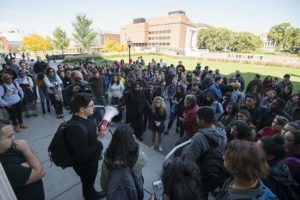 An embarrassing 132 faculty members have lost their faculties, signing a letter demanding a total cessation of classes and organized campus activities due to abject fear of “Free Speech Week” later this month. No word yet on how many lollipops the faculty will demand. Or crying pillows. Or stuffed teddy bears for those who need a safe space to recover from the trauma of hearing ideas they don’t like or probably don’t even understand. Shapiro isn’t by any stretch of the imagination a right-wing radical. He’s polite, thoughtful, and a strong critic of both President Trump and of the “alt-right” movement that does harbor racists and provocateurs. But he also belittles (quite rightly) the idea that campuses need “safe spaces” where unwanted ideas are unwelcome, and he holds to other conservative views as well. For half-wits who can’t tell the difference between a conservative and a fascist, Shapiro’s ideological sins are something like Binkley’s Closet of Anxieties emerging from the Bloom County comic strip and galumphing all over campus….